An interview with a candidate! I can't get that song out of my head! 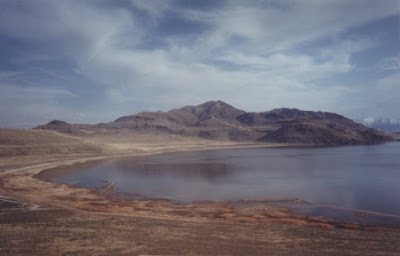 This picture was taken on an island in the Great Salt Lake. The term ISLAND is used loosely. You can actually drive to this island by way of a causeway. We took the kids out here a few years back. so it's more like a peninsula? did i ever tell you about the time i was driving out in the salt flats and got the vehicle up to 125 mph? Not technically...it started out as an island and then a causeway was built so that people could drive to the island....sorta like a bridge but made with dirt and rocks. I can just see you zooooming along those salt flats no holds bar. now, i'm good to get the speedometer up over 55~! not this year though...our wonderful "global warming" brought TONS of snow, which turns into spring runoff, which fills the lakes and resevoires. You should have a beautiful Spring then this year! Enjoy!